My Bohol Tour Day 1 is whelming that put me to thinking what my Day 2 & 3 will offer me. 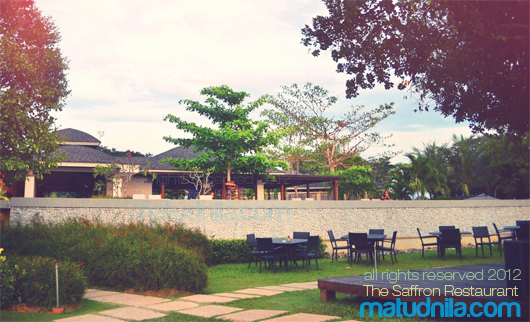 A Buffet Breakfast at The Saffron Restaurant in Amorita Resort start my day from a comfortable sleep in the resorts Deluxe View Villa. Deluxe Rooms at Amorita have fine furniture including a breakfast nook and daybed. It has his own controlled air-conditioning unit, a cable tv, a coffee & tea maker, mini bar refrigerator and safety deposit vault. Hairdryer is provided, with other resort room compliments. One thing I appreciate with Amorita Resort is their value to the Environment. They have these little "Environment - Friendly Advice" desktop reminders and options to help maintain green environment. The very important meal - breakfast is done, first on our list for Day 2 is Balicasag Island Snorkeling and Introductory dive with Amorita’s dive concessionaire - Sea Explorers. Excited to plunge into the sea water - we attentively listen to the Master Diver from Sea Explorers and put in our dive shoes and life jacket, and brought our dive fins, dive mask with tempered glass and snorkel. We had a snorkeling at the vicinity of Balicasag Island, we take about 90 minutes via motor banca or pumpboat vice versa from Alona Beach to Balicasag, we spent 35 minutes of snorkeling which adds our Bohol adventure into the sea. Balicasag has great coral formation and schools of fishes including a sea turtle or pawikan. We headed back to the resort, refreshens ourselves and convene for a sumptuous lunch. 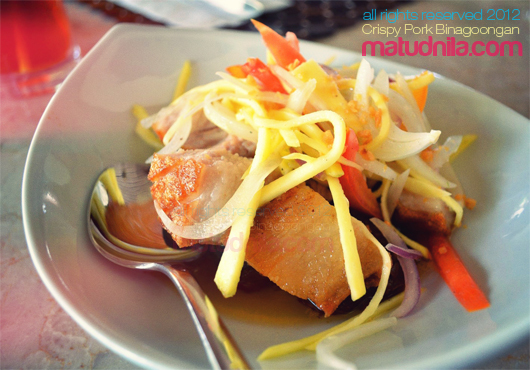 Take this, Crispy Pork Binagoongan of Amorita Resort is a "must-try" piece, its a Lechon kawali vis-a-vis with layers of bagoong and kangkong plus the winner green mango, onions and tomatoes strips that compliments each other. Makes my mouth waters while editing this photo and writing this sentence. All of us agreed. Other menu served is Crispy Pork Sinigang, also a winner in taste. That, was, a perfect lunch! Now, I'm excited to the next item, its the Beyond Bohol Tour by Day offered by Amorita Resort. Most of us who had been to the Province of Bohol did the usual Chocolate Hills in Carmen and Sagbayan Peak climbing, Tarsier watching, Loboc River Floating-Restaurant Launch with Rondallas & traditional dancers or the Hinagdanan Cave Experience. But Beyond Bohol Tour by Day is more than that. The exclusive Beyond Bohol Tour is in partnership with Philippine Bohol Arts Foundation that highlights authentic Boholano life, art, culture, and history. It is around 1:30 in the afternoon when we reached our first stop, The Cloribel's Ancestral House, the house is still functional and accepts arranged visits or tours, the oldest diploma I saw here is 1935. Next stop is Dauis Jewelry Makers Organization which plays great part in the ancestral jewelry making handcrafts in Bohol. Just a stone-throw distance is The Nuestra Señora de la Asuncion church which houses the miraculous Mary's Well and Bohols's oldest "Baluarte" or watchtower at church's yard . 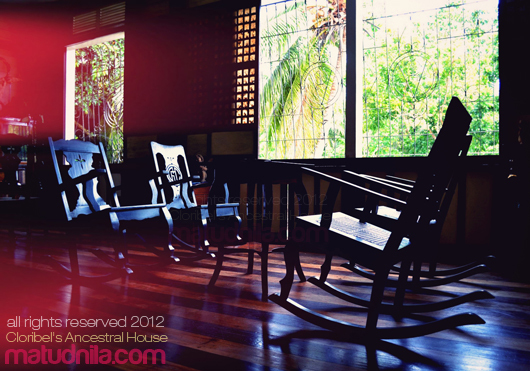 In Dauis Pilgrim Heritage Center includes handumanan souvenir shop, Cafe Lawis and Terraza de Mariveles. We also drop at D' Original Osang's homemade pastries and 2nd oldest church in the country, The Baclayon Church in Tagbilaran City - See below if you can spot Pope Pius IX from one its foundation walls. Such a wonderful heritage of Bohol, it is. Our last stop? Its the Catigbian Municipality GREAT Catigbian Adventure “Green Recreational Eco-Adventure Tour” in Catigbian's DATE Park “Dagook Adventure Tour Experience” . A travel time of almost 45 minutes from Tagbi, The Catigbian Eco-Adventure facilities includes a Canopy Walk, Monkey Bridge bellowed Dagook Falls, Trekking and from a 200m Hill slide through a cable in a Mountain Slide similar to zip-line. I was able to complete all four in at least 35 minutes. the last one is the most challenging for me! Refreshments are serve after completion includes Buko Juice, hot chocolate "tablea" and puto or "malagkit rice" Rest assure that all harness are tested safe plus the guidance of Great Catigbian staffs. Thanks to the Catigbian Adventure for a great adventure from the hills! Matudnila.com Blogger on harness at Great Catigbian Tour. 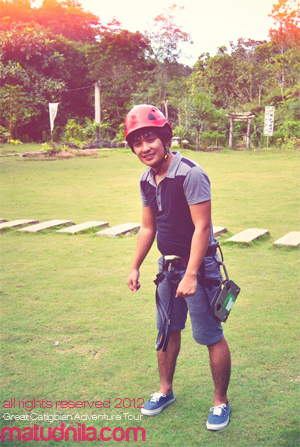 From Catigbian Eco Adventure, come mixed emotions from my first mountain zip line. From the municipality of Catigbian we headed back to Amorita Resort at Panglao Island for a Ginger Degustation Menu. Just as we drive a couple of minutes everyone in the Amorita Van falls asleep. My Bohol Tour Day 2 is about to close. We arrive back the resort about past 7pm, freshens up in our room and prepare as we're about to enjoy Ginger Degustation fine-dining at the Saffron Restaurant viewing deck. The line-up indites with homemade Ginger Bread, Fresh Tuna Kinilaw set on mango carpaccio with spiced coconut sauce. Ginger refreshments Carrot & ginger cappuccino and Coconut & ginger sorbet. The main dished, Apple-Ginger Marinated Beef Medallion set on garlic pechay topped with ginger butter sided with sticky coconut yam and apple-ginger relish. The dessert, Orange Ginger Panna Cotta. Its my first time for a Ginger degustation menu and it is indeed a winner! After breakfast, my Bohol Tour Day 3 is spent with the Amorita Resorts amenities, kinda uneasy because its my last day at the Resort. I'm gonna missed Amorita. Same with my other trips in Sta Fe, Bantayan Island its very awkward at the last day of your vacation. Makes me wanna stay for good in these piece of "Nirvana on earth". If I'm gonna list the things that I'm gonna missed from these 3-day trip in Bohol, it's the same as writing my blog post for this trip twice cause I'm gonna missed just all. We check-out at Amorita resort around 10:30, say goodbye to My "Little Love" Amorita Resort and catch up Ocean Jet going back to Cebu City. This trip is great. I hope to find many other great travel opportunities. I enjoy every minute of it. Great Catigbian adventurecan be contacted at this Phone no. coming soon. If you miss the first part of My Panglao Island Bohol Summer here is Bohol Day 1. Amorita Resort Panglao Bohol Accomodation featured at Cebu Events Blog. 2 comments: on "Beyond Bohol Tour, Eco-Adventure and Heritage Visit, Not the usual route"
This makes me want to visit Bohol like right NOW! 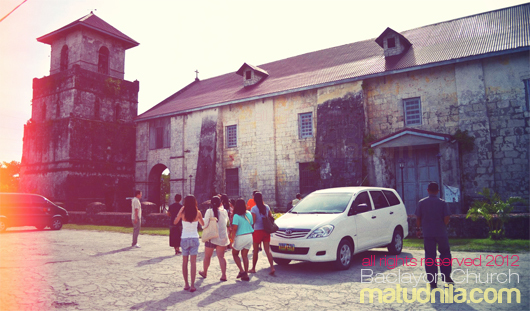 Many more secrets in Bohol that is yet to be discovered. I want also to visit the people living on Central Bohol where the famous Chocolate Hills are located.